Above all, enjoy what you do! Teach Guidelines for Musicians, by teaching the basics of musicianship, for example: how to advertise, how to dress for the gig, successful gig marketing and presentation, preparing for gigs, keeping a logbook of performances, learning to play for a specific audience, writing courtesy thank-you notes, playing for free-fun-or money, confirming performance dates, bringing appropriate equipment (chair, amps, music stand, music, etc), how to play for a vocalist, how to play with other performers, rules for playing in an orchestra, making a playlist, understanding financial and legal issues regarding the music business, among other ideas. 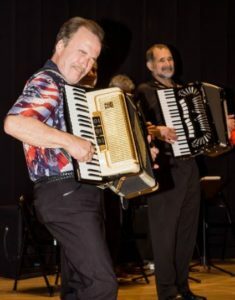 Promote the versatility of the accordion and eliminate stereotypes of the past that cast the accordion as a “polka instrument” alone. Focus on listening skills, timing skills, bellows controls, and keyboard attack. Train for solo, ensemble, and orchestra involvement.